Station Hollywood: Happy birth anniversary to Manna Dey. Happy birth anniversary to Manna Dey. Happy birth anniversary to Manna Dey. The viewers of bollywood films and music lovers all across the country wish happy birthday to Manna Dey on 1st May 2018. Born on 1st May, 1919, he had contributed in bollywood films for more than 70 years with his baritone voice. He had brilliant classical training and adorned bollywood music with versatile talent. He was awarded the dadasaheb phalke award for his immense contribution to music in India. Manna Dey learned music from Ustad Aman Ali Khan and Ustad Abdul Rahman Khan. He stormed bollywood films with super hit songs in Raj Kapoor’s film Shree 420 in 1955, with immortal songs composed by Shankar Jaikishan like “ramaiya vasta maiyya”, “pyar hua ikraar hua”, “mur mur ke na dekh”. During the golden Manna Dey was probably the only singer other than Mohammad Rafi who had been used by all the leading composers of bollywood music including Shankar Jaikishan in Basant Bahar, the song being “sur na saje”, Madanmohan in Dekh Kabira Roya, the song being “kaun aya mere man ke sware”, Roshan in Dil Hi To Hai, the song being “laga chunari me daag”, SD Burman in Meri Surat Teri Ankhen, the song being “pucho na kaise”, to name a few. Manna Dey had a very sweet relationship with Sudhin Dasgupta. He was used by almost all the leading composers of Bengal namely Anil Bagchi, Nochiketa Ghosh, Salil Choudhury and others. But probably his westernized andaz was used to the limit by Sudhin Dasgupta. Sudhin Dasgupta used Manna Dey in Uttam Kumar’s film Goli Theke Rajpoth with the song “lag lag lag lag bhelkir khela”. 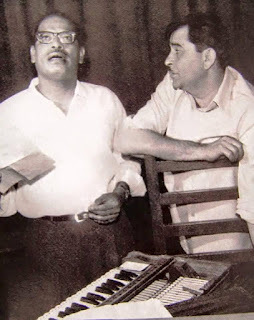 Manna Dey’s songs “ami agantuk” and “ke prothom kache esechi” composed by Sudhin Dasgupta in Uttam Kumar’s film Shankhabela created sensation in Bengali celluloid in 1966. Manna Dey’s songs “ami kon pothe je choli” and “bachao ke acho” in Uttam Kumar’s film Choddobeshi became super hit as well. In the 70s, Manna Dey’s songs “esechi ami esechi”, “lekha porata shikhe phele” and “paye paye joriye rakho” in Uttam Kumar’s film Har Mana Har created sensation as well. Uttam Kumar gave the lips of his lifetime in the film Har Mana Har. While major success of Sudhin Dasgupta came in Uttam Kumar’s films, he made major contribution in Soumitra Chatterji’s films as well. The songs “ei shohor theke aro anek dure”, “hoyto tomari jonyo”, “jibone ki pabona” in the film Teen Bhubaner Pare, composed by Sudhin Dasgupta and sung by Manna Dey showed the westernized orchestration of the giant composer. Sudhin Dasupta’s songs in Soumitra’s films Prothom Kodom Phul and Bosonto Bilaap were equally successful. Manna Dey’s all round musical skills were used to perfection in these films. Even the song “ogo tomar sesh bichare asay” sung by Manna Dey in bayul andaz in Kali Banerjee’s legendary film Dak Horkora, and composed by Sudhin Dasgupta made the viewers speechless. Manna Dey sang many numbers of solo numbers as basic discs under the compositions of Sudhin Dasgupta. One of the notable songs included “ami taar thikana rakhini”. The songs of Sudhin Dasgupta and Manna Dey combination should be preserved and restored. Music-lovers wish Manna Dey to continue singing till his last day of life. Manoj Kumar deserved Dadasahab Phalke Award. Happy birthday to Jaya Bacchan.